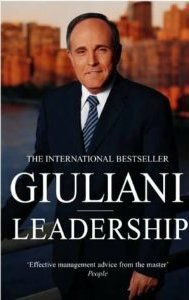 Nearing the end of his tenure as New York City Mayor, Rudy Giuliani decided to write a memoir focussing on leadership. He and his co-author, Ken Kurson, worked on it through the spring and summer of 2001, the latter observing the Mayor and asking how and why he did the things he observed. Copious notes were made, and various principles identified, memories revived and lessons remembered. Then, on September 11, 2001, two aeroplanes flew into the twin towers of New York’s World Trade Centre. In the aftermath of that terrible event, millions of people around the world who had no idea New York even had a mayor, let alone what his name might be, became familiar with Rudy Giuliani. The lessons he had learned over a life time of leadership were put to the harshest of tests in those dark days and weeks. The city needed a strong leader and, having just recently written the handbook, Giuliani was ready and able to step up and lead the people he loved when their world was, literally, falling apart. This book would have been well-written and extremely useful anyway. With the added ‘worked examples’ of ‘how this lesson, habit or discipline plays out in real life’ it is a powerful and enlightening book that I’d recommend to anyone interested in leadership, autobiographies, 9/11, New York or just good writing. My only criticism of it is that it is a little un-self-critical. Giuliani comes across as someone who’s pretty pleased with himself and how he has conducted his life, which gives a slight tone of arrogance that gets a little wearing after a while (hence I started reading it at Christmas, but have only just finished it – it is a fast read, but I put it aside for a while because it just started sounding a bit smug). What is also fascinating is how disastrous his personal life seems to have been. I had no idea about any scandals surrounding him, and haven’t subsequently researched them, but he alludes to them briefly, then puts them aside, noting only that he was once married, is no more, and had at least one affair. I read this at the same time that I read Courageous Leadership by Bill Hybels, and it was striking to notice the difference between how these two very successful leaders spoke about their family lives. For Hybels, his leadership success is nothing to him if his family is suffering. He alludes to a time when he got the balance wrong but speaks of his gratitude in having wise and Godly friends come alongside him and urge him to correct the error. If Giuliani had such a chance, he doesn’t mention it. So read this book. I found its explicit lessons more useful and more widely applicable than Hybels’, and the way he turned around the city of New York is truly inspiring and encouraging. But read between the lines, too – don’t miss the unsaids. If he attributes much of his success to working till 3am then being up again at 6, where was he building in time to love, serve and share with his wife and children? If it’s true that we can measure success by the fruits it bears, the fruits of a person’s life are not limited to his performance in one job.